Heat the cooking oil in a wok or large skillet over medium heat. Cook and crumble ground pork until done, about 3-4 minutes. Set aside to cool. Heat a small skillet over medium heat. Toast the uncooked rice in the skillet, stirring every few seconds to avoid burning until the rice is golden brown and has a nutty fragrance. Use a coffee grinder or mortar to pound rice until it turns to a powder. Once the pork has cooled for at least 5 minutes, stir in the toasted rice powder, fish sauce, chili sauce, sugar, and lime juice. Add pepper to taste. 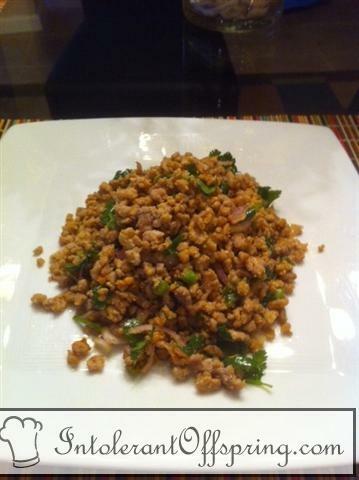 Toss the pork with shallots, green onions, cilantro, and mint. Garnish with red chilis if desired. Serve over rice or wrapped in cabbage or lettuce leaves.